In recent years, we have heard statements indicating that it is possible to decouple GDP growth from energy growth. I have been looking at the relationship between world GDP and world energy use and am becoming increasingly skeptical that such a decoupling is really possible. Prior to 2000, world real GDP (based on USDA Economic Research Institute data) was indeed growing faster than energy use, as measured by BP Statistical Data. Between 1980 and 2000, world real GDP growth averaged a little under 3% per year, and world energy growth averaged a little under 2% per year, so GDP growth increased about 1% more per year than energy use. Since 2000, energy use has grown approximately as fast as world real GDP–increases for both have averaged about 2.5% per year growth. This is not what we have been told to expect. Why should this “efficiency gain” go away after 2000? Many economists are concerned about energy intensity of GDP and like to publicize the fact that for their country, GDP is rising faster than energy consumption. These indications can be deceiving, however. It is easy to reduce the energy intensity of GDP for an individual country by moving the more energy-intensive manufacturing to a country with higher energy intensity of GDP. What happens when this shell game is over? In total, is the growth in world GDP any less energy intense? The answer since 2000 seems to be “No”. It seems to me that at least part of the issue is declining energy return on energy invested (EROI)–we are using an increasing share of energy consumption just to extract and process the energy we use–for example, in “fracking” and in deep water drilling. This higher energy cost is acting to offset efficiency gains. But there are other issues as well, which I will discuss in this post. If GDP growth and energy use are closely tied, it will be even more difficult to meet CO2 emission goals than most have expected. Without huge efficiency savings, a reduction in emissions (say, 80% by 2050) is likely to require a similar percentage reduction in world GDP. Because of the huge disparity in real GDP between the developed nations and the developing nations, the majority of this GDP reduction would likely need to come from developed nations. It is difficult to see this happening without economic collapse. I started this analysis by looking at trends (1) in real GDP and (2) in total energy consumption for a number of countries, and was struck by how different the patterns appeared. Up until 2005, the USA was able to increase real GDP by 3% per year, while increasing energy use by only 1% per year. The 2% savings would seem to come from some combination of offshoring and energy efficiency. Since 2005, the relationship between GDP growth and energy growth has been closer. 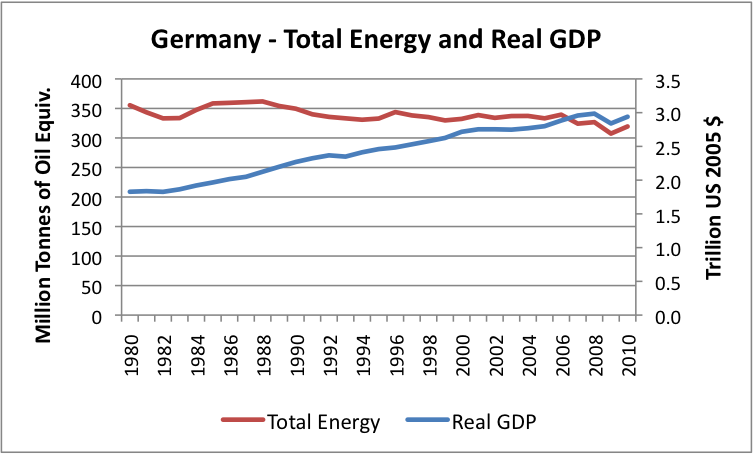 Figure 3 - Germany's total energy consumption and real GDP. Germany is another example with much higher GDP growth than growth in energy use. 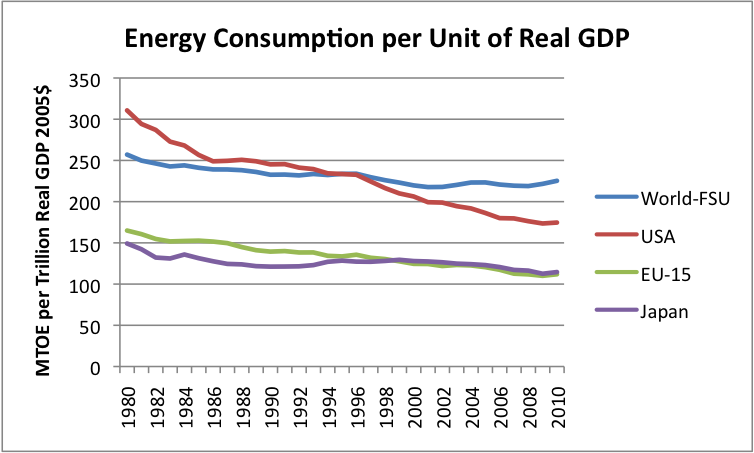 Between 1980 and 2005, energy use was close to flat, while GDP rose by an average of 1.7% per year. 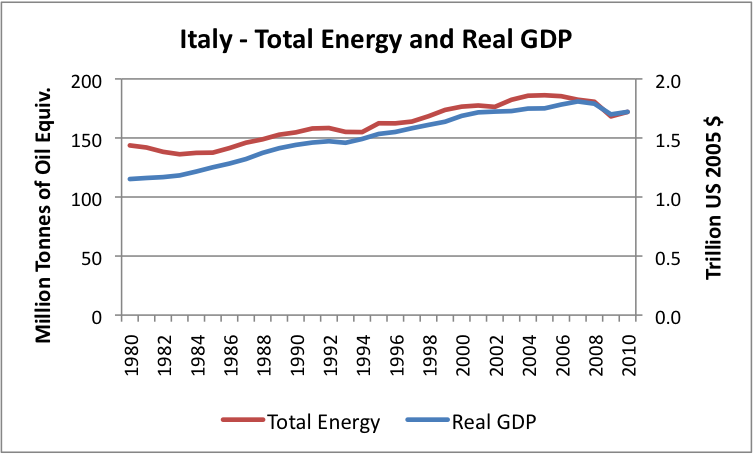 Italy’s real GDP grew by about 1.7% a year between 1980 and 2005, while its oil use grew about 1.0% per year, so it too shows energy efficiency/offshoring gains, amounting to about 0.7% per year. This gain is less than that of the USA and Germany, but Italy was also less industrial to start with, so offshoring was less of an option. 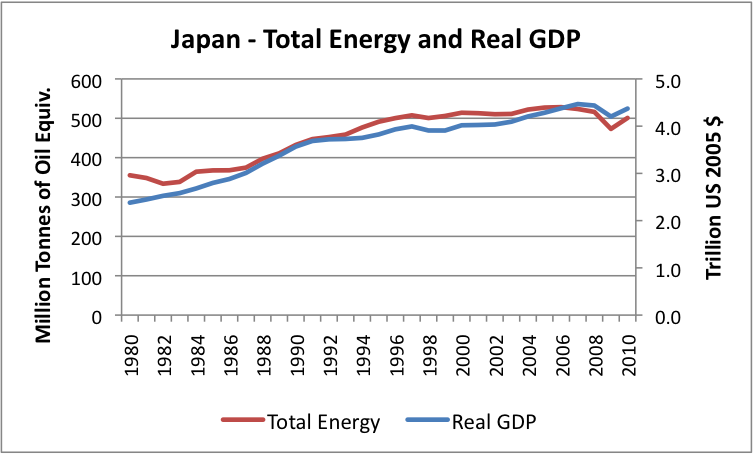 The tie between energy consumption and GDP growth has been much tighter for Japan, especially since about 1987. Since 1987, the two have grown at about the same rate. 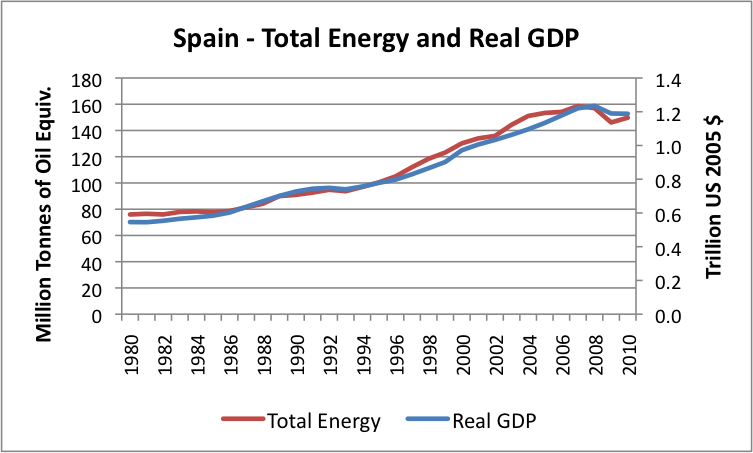 Spain has also showed a very close tie between growth in energy consumption and growth in real GDP, with both growing by close to 3% per year between 1980 and 2005. 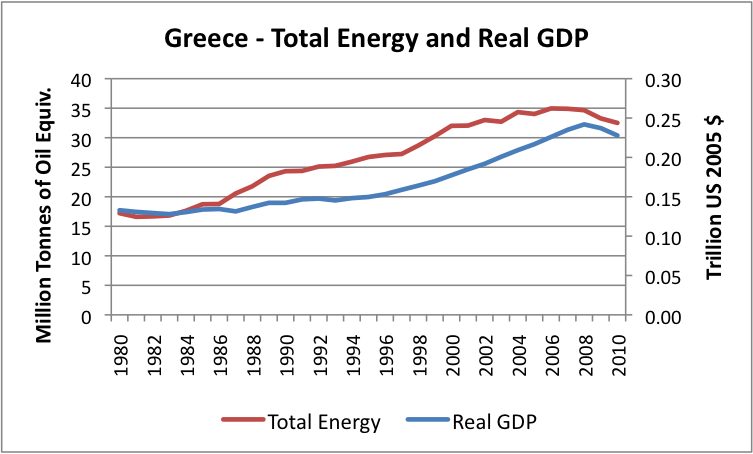 Greece managed to grow its energy use faster than real GDP during most of the 1980 to 2005 period. This may contribute to its current economic problems. Figure 8. 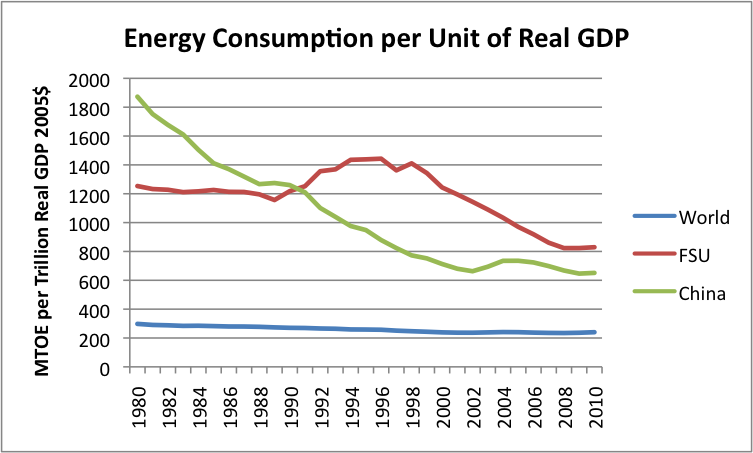 China's energy consumption and real GDP. 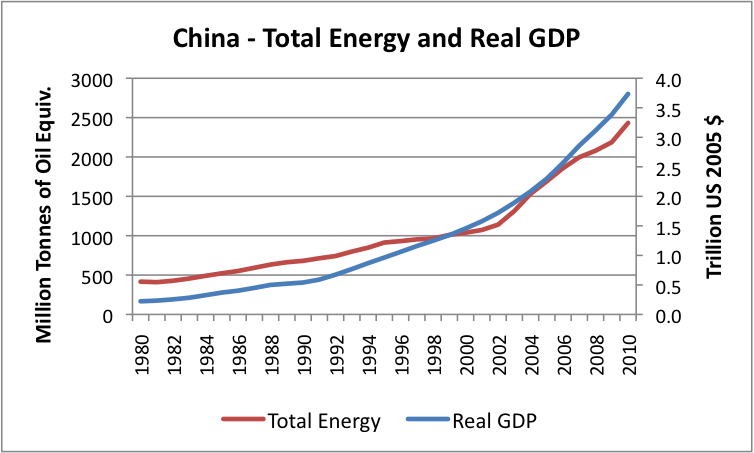 China shows more rapid growth in real GDP than in energy consumption. Its real GDP grew by about 10% a year between 1980 and 2005, while energy use grew by a little less than 6% per year. Between 2005 and 2010, real GDP continued to grow by about 10% per year, while energy use grew by about 7.5% per year. The country has been changing so rapidly that a person wonders how accurate the early GDP numbers are. Figure 9 shows that the pattern for the Former Soviet Union (FSU) has been very unusual. 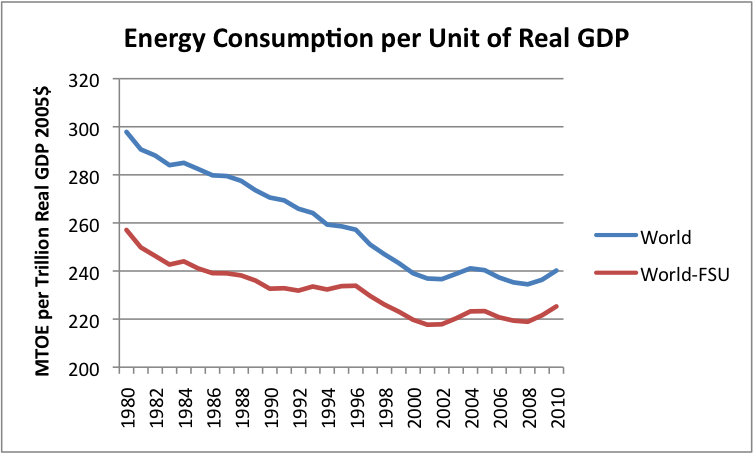 Both energy use and real GDP collapsed after the collapse of the Soviet Union, but the drop in GDP was greater than the drop in energy use. Recently, real GDP has been soaring while energy use remains flat, suggesting that outsourcing of high energy manufacturing is occurring, or that new sources of GDP that do not require much energy use are being created. 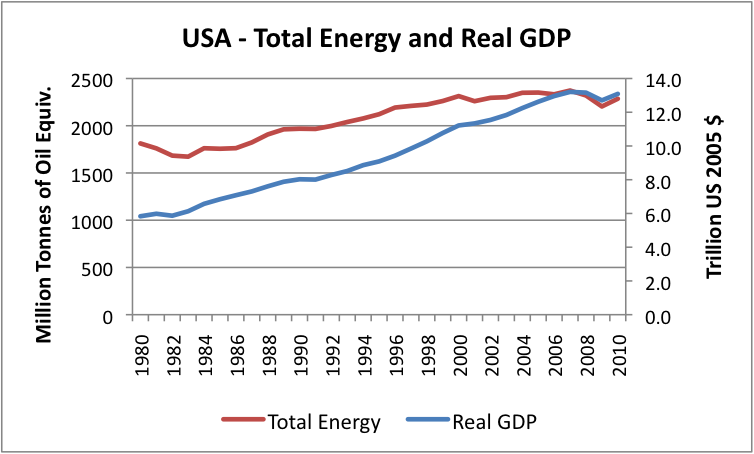 The usual way of measuring energy intensity is as the ratio of energy consumed to real GDP (the red line divided by the blue line in the above graphs), and these ratios vary greatly. In fact, it is hard to even put energy intensities for different countries on the same graph, because the amounts are so different. Figure 11 shows that energy intensity on a world basis has been flat since 2000. This is also the case when FSU data is excluded. We expected recent world energy intensity to be flat, based on Figure 1 at the top of the page. Why does world energy intensity remain flat, while energy intensity for many individual countries has been decreasing? Looking at world energy intensities, it appears that the huge amount of outsourcing is resulting in pretty much comparable energy use to the original energy that was outsourced. It is hard to make a direct calculation of the difference in energy use, because much of the new energy use is indirect. For example, the government of the developing nation may build huge amounts of new paved roads and concrete homes with tax revenues, and individual workers may buy new cars with their salaries. These amounts are not captured in a simple comparison of the energy used in making a widget in the USA relative to the energy used in making a widget in China, for example. Another issue is that the energy use of interest is per dollar of real GDP, and a savings in energy that results in a cost savings may not be very helpful in lowering energy intensity of GDP. For example, suppose that a manufacturer creates a new, smaller car, that is 20% cheaper and uses 20% less gasoline on an ongoing basis. More workers will be able to afford this car. Furthermore, a well-off worker who can afford this new cheaper car (and who could also have afforded a more expensive car) will have left-over money. With this left-over money, the well-off worker can purchase something else, such as an airline trip, food flown in from overseas, or a new iPod. All of these extra purchases take energy as well. So when the overall picture is viewed, the fact that more energy-efficient cars are being manufactured does not necessarily translate to lower energy intensity of GDP. One issue mentioned in the introduction to this post is the fact that EROI for fossil fuels is declining because the easy-to-extract fossil fuels have mostly been extracted. As a result, we are now extracting the more difficult to extract fossil fuels, requiring more energy. A similar situation occurs in many other endeavors, because we live in a finite world, and we are reaching limits. In mining, the quality of ores is getting poorer, meaning than more energy needs to be used in extraction. In farming, we are stretching our resources tighter, requiring more fertilizer, pesticides, and more irrigation, all requiring energy. We are running short of fresh water in some places, so water is pumped from greater distances or desalination is used, adding to energy usage. Pollution is an issue, so we require utilities to add scrubbers to old coal plants. All of these efforts require energy, and likely contribute to an upward trend in energy usage, offsetting efficiency savings elsewhere. Another issue that tends to raise energy intensity of GDP is the long-term trend toward using machines and additional energy to do jobs, rather than simple human labor. For example, if a person chops down a few trees and builds his own house, most calculations would say that there is neither GDP nor (outside) energy used. If a person hires a builder to build a house, and the builder uses hand tools to chop down trees and human labor to build the house, the result is an increase in GDP, but little fossil fuel energy use. If the builder becomes more “modern” and uses earth movers and concrete to build homes, then energy use rises relative to GDP created. 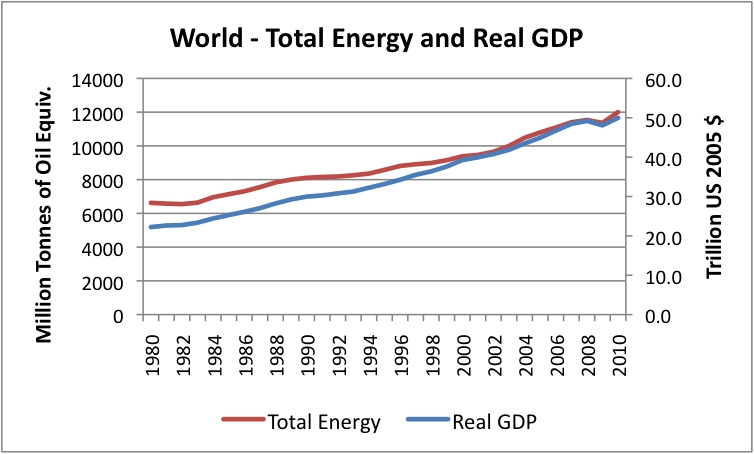 The ratio (Energy Used /GDP) is simply energy intensity, which was graphed in Figures 10a, 10b, and 11. 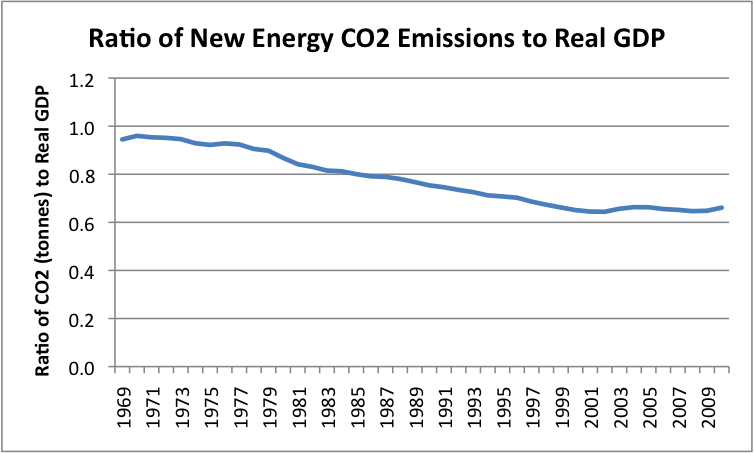 The other ratio is (CO2 Emissions / Energy Used) graphed below in Figure 12. It shows a similar pattern: declining prior to 2000, and then leveling. 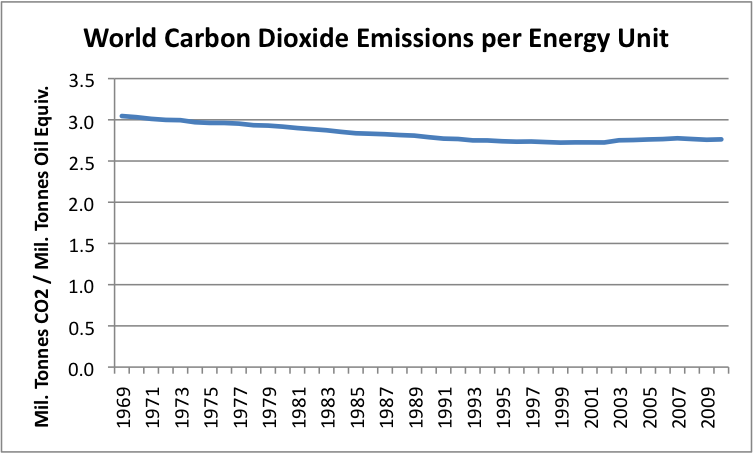 Figure 12 - Carbon dioxide emissions per barrel of oil equivalent energy, based on BP Statistical Data. The ratios in Figure 12 reflect changes in energy mix over time, and their relative propensity to generate CO2. Since 2000 these emission per unit of energy use have, in fact, started to rise a little, because of the greater use of coal in the energy mix. The CO2 measurements used in this analysis are BP’s calculations, based on the types of energy used each year (including renewables*). They do not reflect actual measured CO2 in the atmosphere. The ratio of new CO2 emissions to Real GDP reflects a combination of these ratios (C02/Energy and Energy/Real GDP) and is shown in Figure 13. Figure 13 indicates what we would expect from Figures 11 and 12: A declining ratio of CO2 emissions to real GDP until about 2000, then fairly flat thereafter. In fact, there is a distinct upturn in 2010. Thus new CO2 emissions from energy sources have been rising about as fast as real GDP since about 2000, and a little faster than real GDP in 2010. This is no doubt discouraging news to those who adopted the Kyoto Protocol in 1997, thinking it would reduce CO2 emissions. Carbon taxes and cap and trade policies seem to encourage outsourcing of manufacturing. The primary benefits of outsourcing would seem to be (1) a reduction in imported fossil fuels, (2) lower cost of manufactured goods to the consumer, because of lower labor costs, and (3) possibly higher profits to the company selling the new cheaper product. Offsetting these benefits are a loss of jobs for the country doing the outsourcing and a loss of control over what types of energy are used in the manufacturing process. It seems to me that we would be better off not encouraging this outsourcing, especially when essential goods are being created. One misconception that seems to guide much energy policy is the view the biofuels will substitute for oil, and that use of additional electricity use will substitute for oil. Oil use is pretty much maxed out. Oil supply is very close of inelastic, regardless of price. Someone, somewhere, will use any oil pulled out of the ground, perhaps at a slightly lower price, even if a particular country can reduce its oil consumption through the use of biofuels, or if a car can run on electricity. This means that any biofuel that is created will add to world energy supply, by using natural gas and coal supplies more quickly, since their use is still somewhat elastic. Similarly, by moving energy demand from oil to electricity, we what we are really doing is expanding total energy usage, by burning more coal and natural gas to make more electricity. Thus, from a world CO2 perspective, biofuels and increased electrical usage are not helpful. Individual countries may still find biofuels and expanded electrical use helpful, because they can reduce oil imports, if oil use can be shifted to another country. There is also the hope that we can continue our motoring lifestyle longer, using electric cars. If our intent is really to reduce CO2 emissions, it seems to me that we need to look much more broadly at the issue. Maybe the issue should be viewed in terms of (1) fossil fuel resources that we are willing to use in each future year, and (2) how much real GDP can be created from those resources, given the issues we are facing. The quantity of fossil fuels to be used each future year might consider CO2 goals as well as limits on the amount of oil that can be extracted each year because the “easy oil is gone”. The amount of real GDP that can be created from these fuels would depend on a number of factors, including declining EROI and increasing efficiency. If the plan is to reduce fossil fuel consumption, then we may very well be expecting real GDP to also decrease, perhaps by a similar percentage. 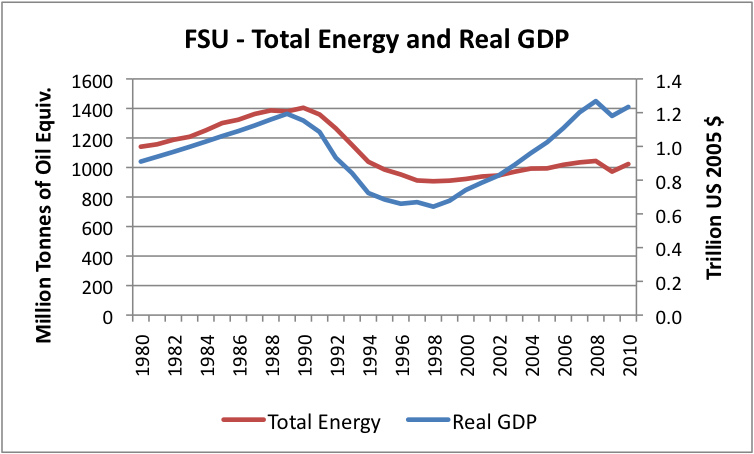 In fact, looking at the experience of FSU in Figure 9, the GDP decline may even be greater than the energy decline. We are facing a challenging time. This post seems to suggest that there is yet another story that we are being told, that isn’t quite true. It seems to me that we need to examine the issues ourselves, come to our own conclusions, and start telling the real story. *I have not attempted to discuss the impact of renewables, since to date their impact has been small. The front-ending of energy use of renewable makes their impact on energy intensity of GDP less beneficial than standard comparisons would suggest. This entry was posted in Energy policy, Financial Implications and tagged decouple, EROI, GDP growth, Kyoto Protocol. Bookmark the permalink. 48 Responses to Is it really possible to decouple GDP Growth from Energy Growth? You can make more stuff with less energy for a while, but eventually you must begin to increase energy use to increase total output. Things like electric motors can be made more efficient, but efficiency can never exceed 100%. Eventually, no matter how efficient your new electric motor is, you will need to use more energy to make more things. So you can improve the amount of work accomplished per unit of energy, but since machines can’t make their own energy, you will inevitably reach a point where the total output can only be increased by using a greater amount of energy. That is why peak oil will be so dangerous. As soon as the amount of total energy available for transportation begins to decline, the cost to transport everything will rapidly increase because other fuels are less efficient, and more costly. A couple of years after the global oil production begins to decline, the global economy will begin to contract, and living standards will probably begin a long, slow (hopefully) decline. I’m assuming the financial system can be kept intact. That is a big assumption with a constantly shrinking economy. I agree. The financial system is a big if. The Euro has been hit first, but the repercussions of it may be enough to damage our system. The current US problems financial are otherwise hidden by government deficit spending and too high debt.